Last month, I discovered the Hot and Nerdy Series by Shannyn Schroeder and was hyped to find the next two books in the series were coming out in November and December. Unfortunately, that meant I needed to wait to read the copies sent to me by Netgalley. When I finally sat down with His New Jam, I was not disappointed. Sydney Peters just wants to make it through the last few football games of the season, so she could kiss her dreaded cymbals goodbye and focus on her love of playing the drums. For as long as she could remember she has wanted to be a part of a real band--not one where she was forced to play an instrument she hates because the guys in the marching band didn't think she could cut it on the drumline. What she doesn't need is a player like Hunter paying her attention. Hunter has tried to get Sydney's attention since the beginning of the school year and with a couple of weeks left in the fall semester he has finally succeeded. Now, all he needs is for her to teach him how to play the drums, so he can teach kids to play, and for her to substitute for his band's drummer. For the most part, I really enjoyed His New Jam, although it took me a little longer than I would have liked to feel a connection to either of the characters. When a book is as short as this one is (about 120 pages) that is not a good thing. What I like about the Hot and Nerdy books is that they don't rely on typical teen tropes. I love movies like She's All That and Grease, but being young doesn't make someone shallow. A good makeover sequence isn't the only thing necessary for young love. Ms. Schroeder is smart enough to understand this and she writes her characters as real people with real problems. While the issue in this book wasn't as complex as that from His Work of Art, it still resonates. Sydney doesn't trust herself because she made mistakes and she's afraid that if she gets involved with another man she'll make the same mistakes all over again. I know a lot of people suffering from those fears--many in my own family and who were much older when they made their mistakes. My other complaint is that I can't stand the covers for these books. They're awful. I think they're supposed to appeal to the Hipster crowd and as I'm not part of that crowd (or age group) I almost skipped over them when scanning Netgalley. 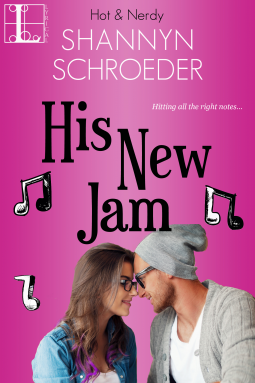 His New Jam is the fifth book in the Hot and Nerdy series. It is currently available for pre-order and will be released on November 24th.